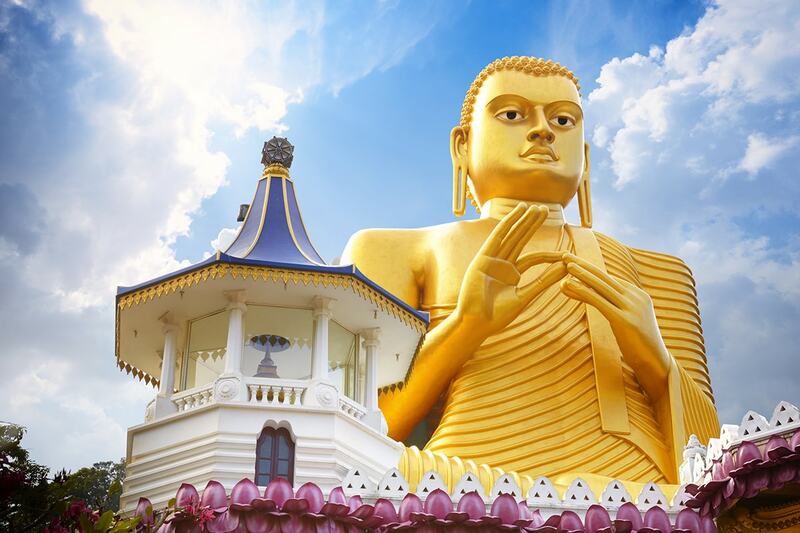 10 day Taste of Sri Lanka tour including return international flights, transfers, accommodation, breakfast daily, in-depth sightseeing and more. per person twin share |	Typically $3,843! Sri Lanka is fast becoming a popular tourist destination for many. Its diverse landscapes range from rainforest and arid plains to highlands and sandy beaches. 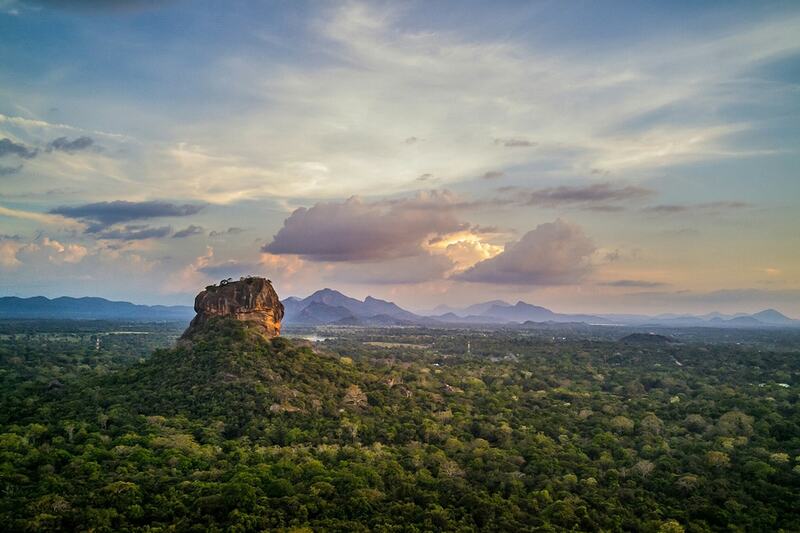 It’s famed for its ancient Buddhist ruins, including the 5th-century citadel Sigiriya, with its palace and frescoes. 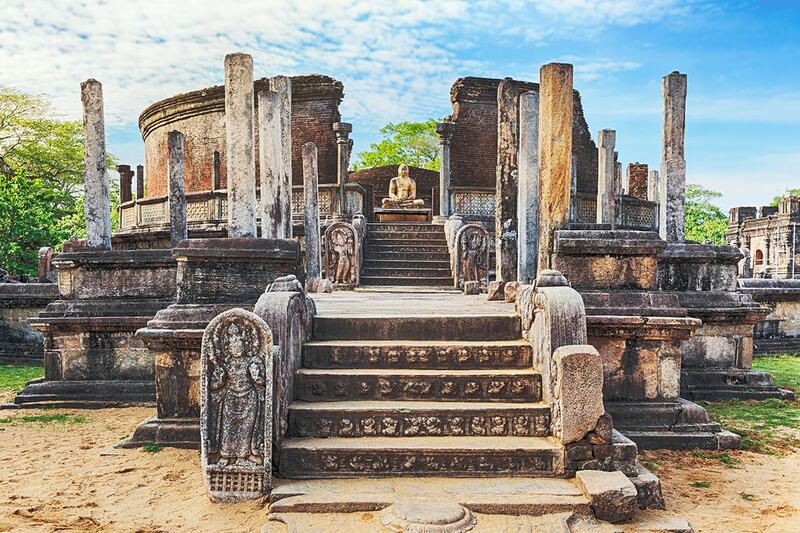 The city of Anuradhapura, Sri Lanka’s ancient capital, has many ruins dating back more than 2,000 years. 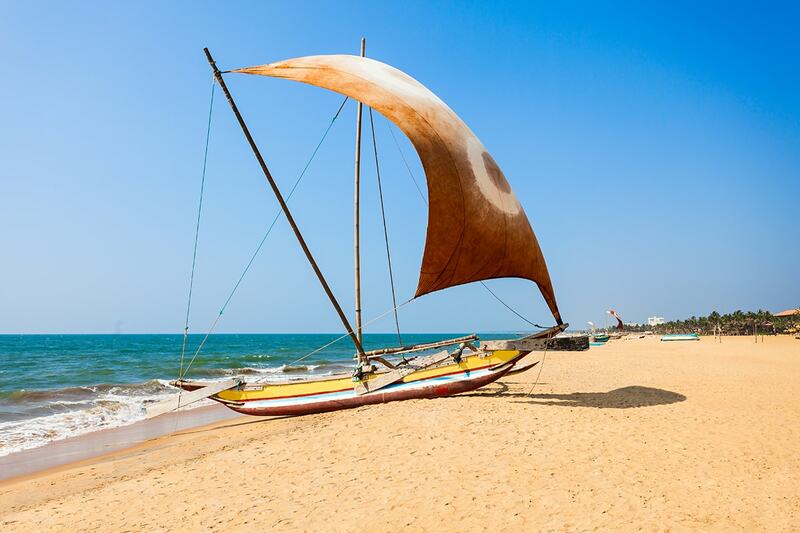 Our 10 day Taste of Sri Lanka tour includes must-see destinations. 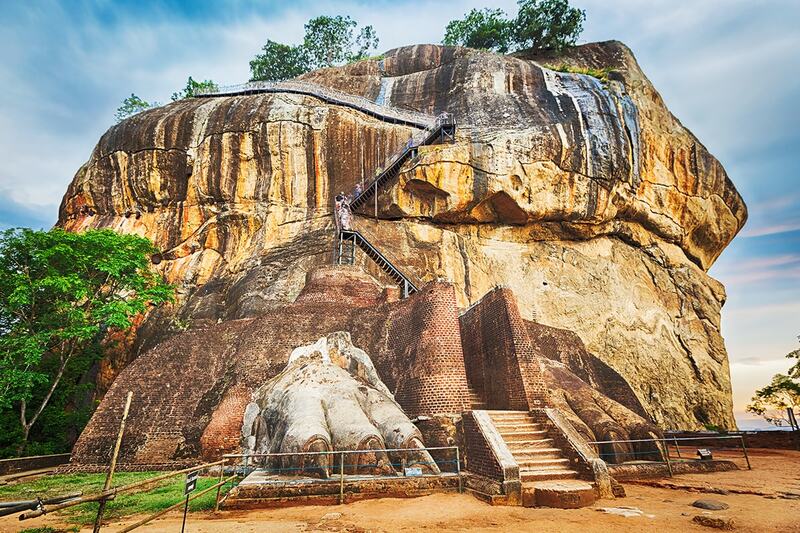 Visit the infamous Sigiriya Rock Fortress, one of the most extraordinary artistic complexes of its time, perhaps Sri Lanka’s single most dramatic sight. 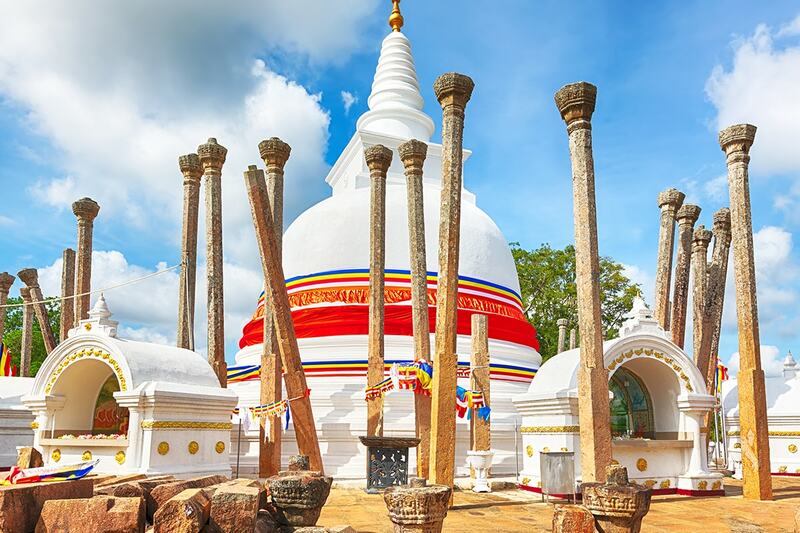 Enjoy a sightseeing tour of Anuradhapura, one of the ancient capitals of Sri Lanka, famous for its well-preserved ruins of an ancient Sri Lankan civilisation. 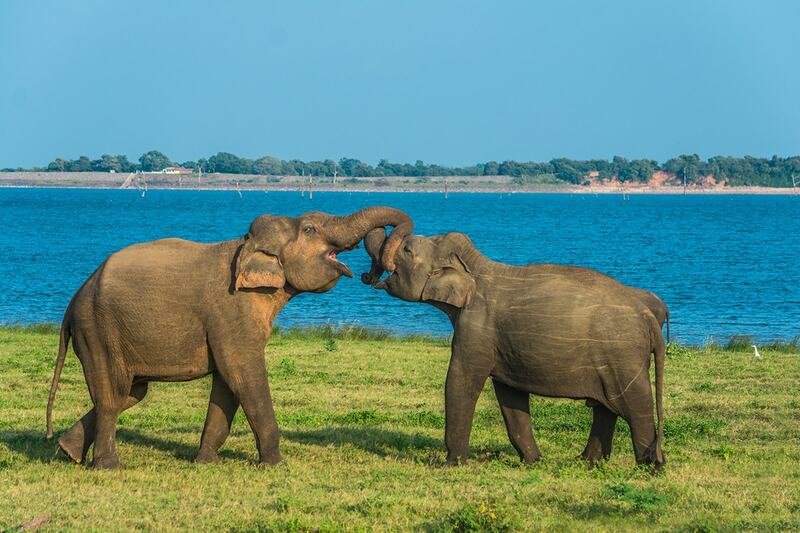 Set on a guided tour of The Medieval Capital Of Polonnaruwa and enjoy a safari tour at Minneriya National Park, where you will hopefully be able to witness the unique phenomenon of elephant gathering. 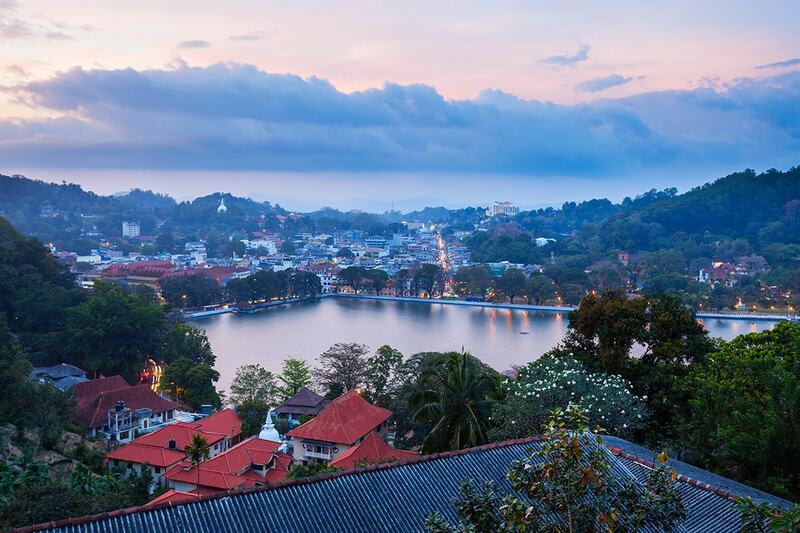 Explore, Kandy, one of the most scenic cities in Sri Lanka that lies in the midst of hills. 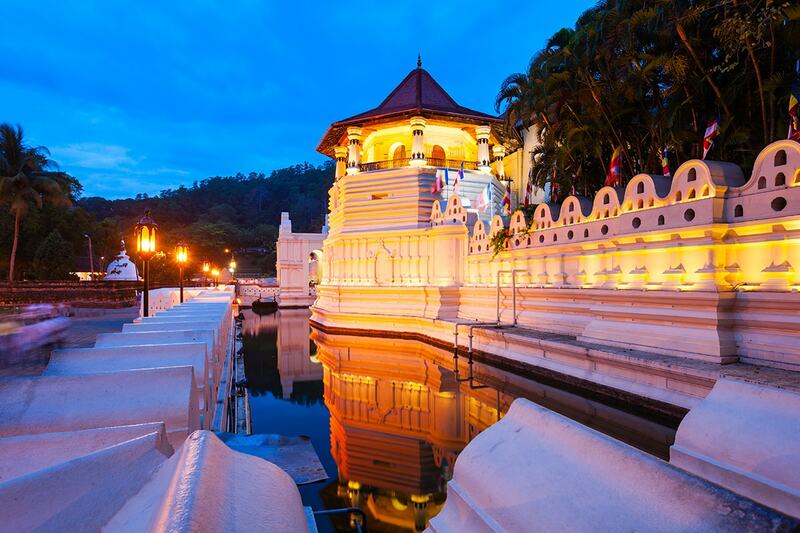 Visit Kandy Lake, local markets and Temple of Tooth, a deeply significant Buddhist site. Journey to Negombo where you will visit a tea plantation before your tour comes to an end. Your package includes return international flights, accommodation, daily breakfast, transfers and more. See a full list of Inclusions here. This morning is free at leisure to relax after your international journey. 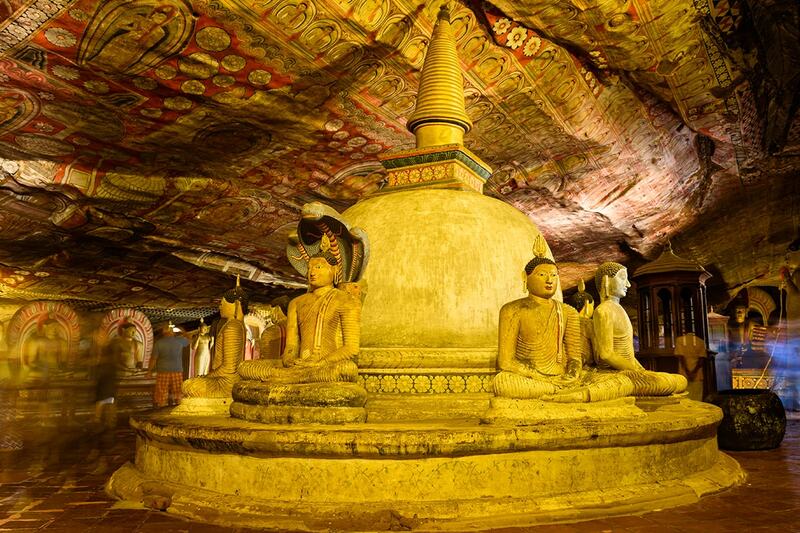 This afternoon enjoy a visit the Golden Cave Temples. This was built by king Walagambahu in the 1st century B.C. and it is a World Heritage Site. 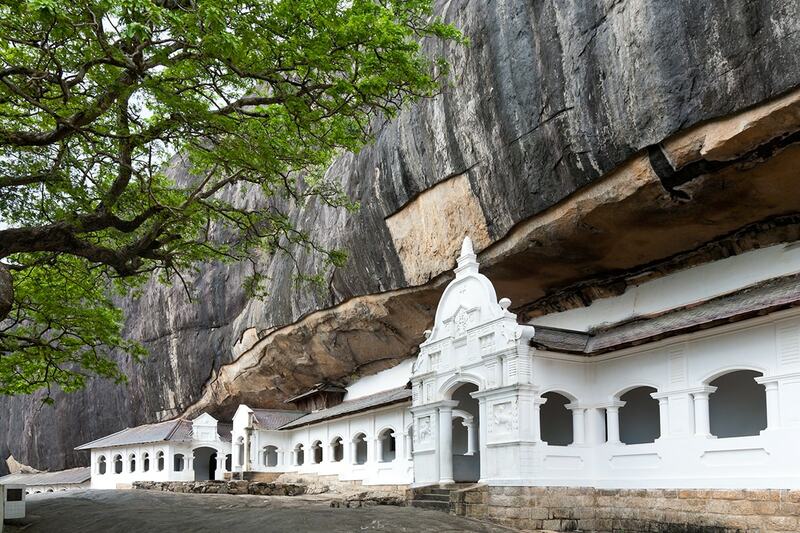 It is the most impressive of Sri Lanka’s cave temples. The complex of five caves with over 2000 sq. meters of painted walls and ceilings is the largest area of paintings found in the world. It contains over 150 images of the Buddha of which the largest is the colossal figure of the Buddha carved out of rock spanning 14 meters. 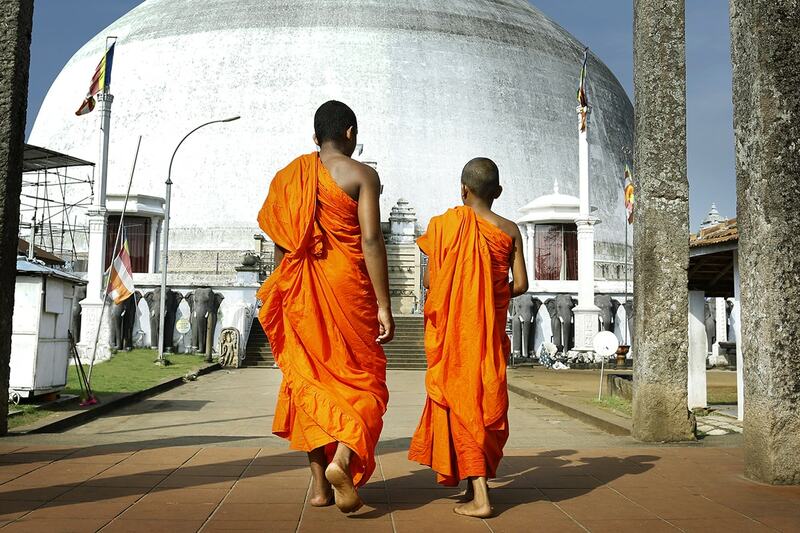 Today set on a sightseeing tour of the ancient mystic city of Anuradhapura. The remarkable city of Anuradhapura is the Sri Lanka’s most sacred town and has some of the most extensive ruins in the world. This city served as a great monastic centre. 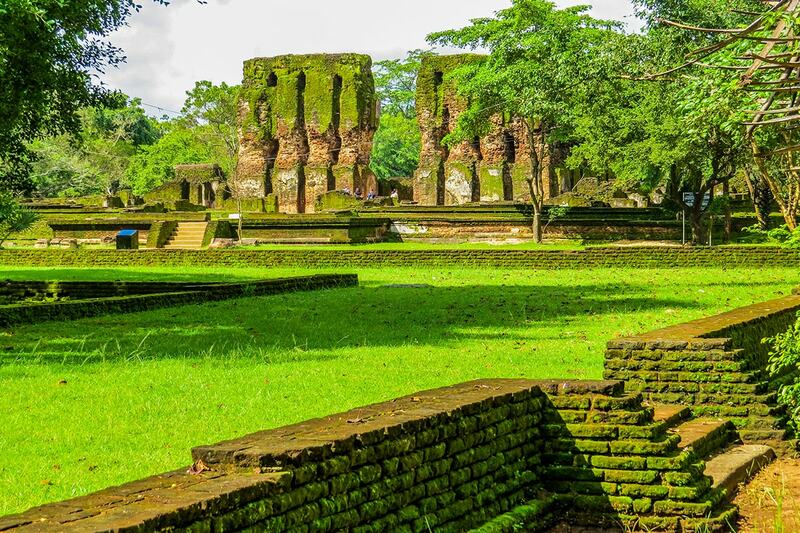 It remained residence and royal capital for over 100 successive Sinhalese Kings for around 1500 years from the 4th century BC to the 8th century AD, after which it was abandoned and the capital moved to Polonnaruwa. After exploring Anuradhapura we return to your hotel. Early morning climb the Sigriya Rock Fortress, one of the most extraordinary artistic complexes of its time (477 – 498 AD). Declared as an UNESCO heritage site in 1982, this magnificent citadel allures artistic and architectural curiosity from around the globe. This afternoon leave on bicycles (or walking) through Augandawa Village, visit the local temple and evoke blessings from the priest. Visit a villager’s house and enjoy a warm herbal drink or a king coconut. Ride through the village passing paddy fields and Chena cultivations. Optional Tour: Cooking Demonstration – take part in a cooking demonstration on Sri Lankan rice and curry preparation (2 or 3 curries) and enjoy the typical Sri Lankan lunch overlooking the paddy fields. This morning, set on a guided tour of The Medieval Capital Of Polonnaruwa. The Palaces, Huge granite sculptures and the massive tanks and complex irrigation systems built by the Great Kings and conveys the extent of development that existed in this middle history period. Afternoon enjoy an exclusive safari at Minneriya National Park. This park acts as a breeding ground to the surrounding jungles during the dry season. The unique phenomenon of elephant gathering, during the dry season, from June to September, could not be sighted at one place, anywhere else in the world! It’s recorded that elephants gathered here are numbed around 150-200. Some reports account number of elephants to as high as 700. In the afternoon set out on a sightseeing tour around the Kandy Town in a Tuk Tuk. 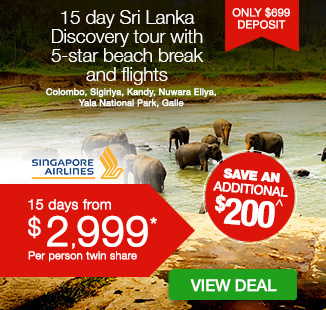 Visit the Kandy Lake, Local markets, etc. Thereafter saunter around the Kandy Lake, the atmosphere alone will intrigue you to spend a few moments here. Evening visit the Temple of Tooth, with its guardian elephants is a deeply significant Buddhist site that contains a tooth of Buddha collected from his funeral pyre and this draws thousands of pilgrims from across the world. Hereafter you will have the opportunity to witness a typical Kandyan cultural performance. Morning leave for Negombo via Kotmale En route visit a tea plantation and factory. Here you will enjoy the absolute tea experience, taking you to the moment the young tea leaves are plucked from the plantation to being processed in the factory to make a steamy cup of tea. If you are interested, the tea factory is the best place to purchase good quality tea. Today you will be transferred to the airport at the appropriate time.